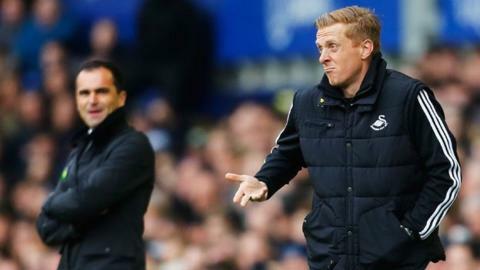 Everton boss Roberto Martinez and Swansea manager Garry Monk have expressed differing views on refereeing in the Premier League. Swansea City manager Garry Monk says he has no agenda for his meeting with referees' boss Mike Riley on Friday. The meeting takes place after Monk's public criticism of the standards of refereeing in the Premier League. The Swansea manager escaped punishment for accusing Stoke winger Victor Moses of cheating in the 2-1 defeat at the Britannia Stadium on 19 October. "It's just a discussion on some of the concerns I've had, to get the insight from him and his feedback ," said Monk. "There's not any outcome or agenda, it's just really to put my points across." Monk described referee Michael Oliver's decision to award a penalty against Swansea after the Moses incident as "disgusting". It prompted the Football Association to ask Monk for his "observations" regarding those comments. Monk had previously sent a list of what he considers to be bad decisions to Riley, general manager of the Professional Game Match Officials Limited (PGMOL). However, the red card handed out to defender Federico Fernandez is unlikely to be a bone of contention after the decision was overturned by the FA on Thursday following an appeal by the Swans. Fernandez, 25, was sent off for a lunge on Liverpool's Philippe Coutinho in the 2-1 League Cup defeat by Liverpool. The Argentine would have served a three-match ban for the offence. But the Swans contested referee Keith Stroud's decision and will now have Fernandez available for Saturday's Premier League match at Everton. Toffees' manager Roberto Martinez - who played with Monk and managed him at Swansea - is happy with the standard of refereeing in the Premier League. "I've never ever seen a team that always gets poor decisions and in the same way I've never seen a team that they always get good decisions," said Martinez. "Yes there are certain teams that are always on the ball and they probably get more breaks than the others, but everything levels up over the course of the season. "We are quite fortunate with our refereeing standards in our league so we shouldn't lose sight of that."